Simplified operation, minimum maintenance and long, economical service are a few of the advantages you get with an ARR-M Series 3 phase utility charger. Electrical and mechanical design features make it ideal for a wide variety of utility, industrial and other standby power supply applications. Common control board for all output voltages and current ratings reduce spares requirements and simplifies maintenance. All three-phase ARR-M chargers, regardless of output voltage & current utilize the same control. This feature allows for minimum parts inventory and simplifies maintenance. DC float voltage is maintained within ± 0.5 percent from no load to full load with input frequency variations of ±5 percent and with AC input voltage variation of +10%/-12% of the nominal input voltage. During operation the maximum output transient does not exceed 6% of the initial steady-state voltage for sudden load changes between 10% and 90% of rated output. Recovery takes less than 300mS. The current limiting circuit is factory set at 100% and is adjustable from 20% up to 100% of rated output. It will hold down to short circuit. The typical power factor is 0.88 when tested on a resistive load and batteries. The ARR-M product series can be operated on a principally resistive load with the battery disconnected for maintenance purposes. Selection of input AC circuit breakers to suite input voltage and capacity as specified by client. 10kAIC and higher capacity rating of output DC circuit breakers available. Also, a single pole DC fuse is provided in the positive leg of the DC output. Surge suppression on input and output for protection of the transient voltages. Optional lightning arrestor available for over-voltage transients caused by external lightning. 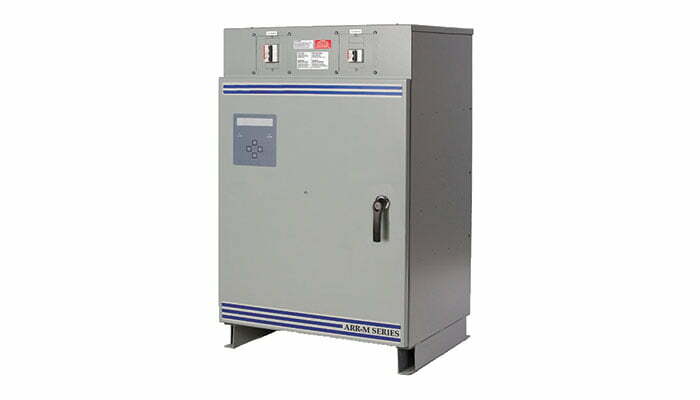 The ARR-M series chargers will operate at 110% of rated DC output, continuously in ambient temperatures of 32°F to 122°F (0°C to 50°C) up to an altitude of 3,300 ft. (1,000m). De-rating of 3.6°F (2°C) for every 990 ft. (300m) over 3,300 ft. above sea level. These units can be safely stored for up to one year at temperatures ranging from -40°F to 185°F (-40°C to 85°C). The ARR-M series chargers will continue to operate in humidity levels of 0-95% (non-condensing). 45-65dBa at 3 ft. (1m) from any vertical surface of the charger. • Consult the factory for Hi Capacity Breakers. * Models listed are 'base' models which require configuration to order. Only one input voltage may be specified per charger. ‘Multi-tap’ models are not available. Please consult sales. ** These models have an external transformer. See datasheet for details.